To bump into wildlife is always an exciting experience that seems to reawaken ancestral memories settled in our souls from the dawn of human history. To meet a bear on the mountains of the central Apennines, or discovering evidences of its presence, is surely a special event that occurs more and more frequently because of the inevitable overlapping between the man activities and the vital area for this species. So, it is advisable that who frequents the mountain gets prepared to such a chance by the knowledge of basic rules of conduct, necessary to avoid a magic opportunity to turn into a cause of stress or risk to the animal and who is watching it. 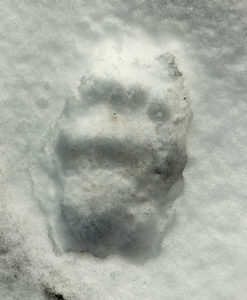 The fact that a bear frequents a specific area can be inferred from visible signs of its presence such as excrements, tufts of hairs, footprints in the mud or in the snow, claw scratches on trunks. It is a good rule NOT to follow footprints, on the ground or on the snow, NOT to “chase” the animal, disturbing and scaring it. But it is important and interesting, when possible, take pictures of a trail or single footprints, possibly using some elements of comparison that would facilitate the comprehension of the trace dimension and the distance among footprints (for example a metre or a popular-sized object). Also the excrements can be photographed, but never removed from their site. Besides, it is important not to touch them because they may contain noxious spores and bacteria. Also the tufts of hairs, that may be found on razor wire or on trunks and shrubs, do NOT have to be touched. In all these cases it would be helpful to signal these signs of presence to the competent authority. If in a protected area, you can contact the institutional representatives. Reports can be submitted to our attention as well. We will pass them to the competent entities. In case of direct meeting with one or more bears, it is advisable to have a respectful and discreet behaviour, restraining from agitation and clamour. If the animal did not notice your presence, it would be possible to keep watching it by staying completely silent and motionless, aware that animals feel movements at first, then the shape and the colours at last. It is useful reminding not to stare at animals that could perceive indirectly our attention, even though they are not able to see us. NEVER run towards the animal, for taking pictures or shooting videos for instance, not to put it to a hasty flight or, even worse, cause a rash reaction. We remind you that the Marsican bear is absolutely a NON aggressive species and man-fearing like other wild animals. Anyway, you must not abuse its good-temperament, especially when accompanied by cubs or in those cases in which the animal might consider itself entrapped without any escape route around. If you meet the bear on a road, it is important that you stop the car and dim the beams (which tend to “hypnotize” animals), waiting for the animal to walk away spontaneously and tranquilly. NEVER pursue the animal by car and put it to a dangerous and panting flight along the road. 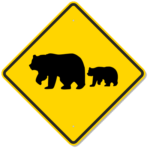 In general, it is a good rule, while driving in mountainous or protected areas, to proceed at a low speed, paying attention to the animals that might unexpectedly jump onto the roadway.